I have the 4k 9550 and was wondering how bad the loss actually is when using the laptop screen? is it playable at 4k with 50-60fps (High Settings) using a 1080 or is it not worth it? could you drop the screen res to 2560, does that make it usable or still not really worth it? Do you reckon using a 1060 in egpu with the internal screen res set to 1080 would be better then the 960m ? @OB1: Do you really need to play at 4k resolution on a 15" 4k screen? If you're going for the GTX 1080 and reduce to 2560x1440 or better 1920x1080 you'll be more than fine and the image would still be crisp and clear. A GTX 1080 is, depending on the game, struggling with 4k even on desktop computers so I don't really see you playing with your settings on the notebook display in 4k resolution. A GTX 1060 will still be far superior to the GTX 960M on the internal display. Around 5500 3DMark11 points for the GTX 960M and 17400 3DMark11 points for the GTX 1060 in a desktop. Taking the loss of performance into account you'd land at least at around 14000 3DMark11 points, but most probably more than that I'd say. Good point reference the 15inch Screen and 4K. I'd be more then happy with a 1060 egpu solution whereby I could use high/max settings on the internal screen at 1080. I was more concerned that because of the TB3 port issue on the Dell XPS 15 being 16GBPS not 32GBPS would it be worth it? and could I achieve good FPS and high settings with the internal Screen at 1080p? I'd say yes. 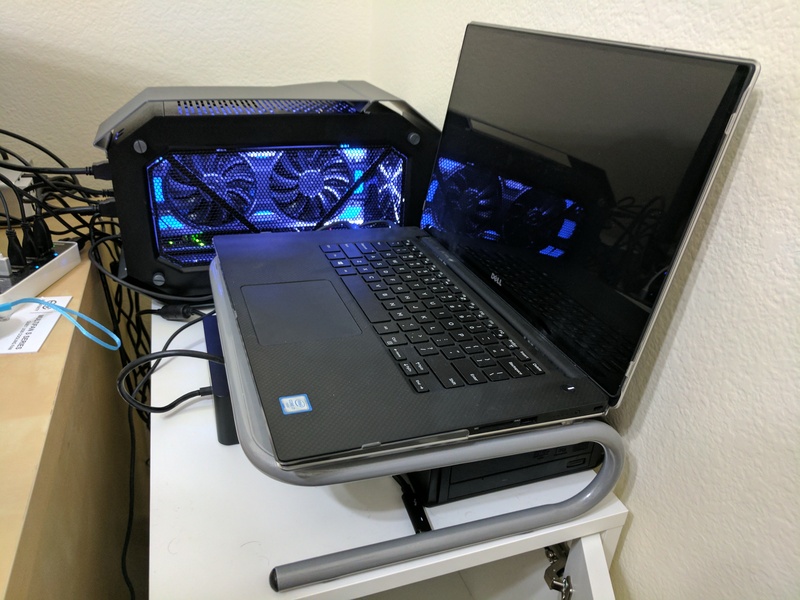 Thunderbolt 2 like performance and a GTX 1060 should still give a pleasant and sufficient solution, many people with Macbook Pro devices that have Thunderbolt 2 are still using them with eGPUs. What about performance editing 4K video in Premier Pro with the XPS 9350 and a GTX 1060? That's my concern. Sorry, a slight clarification... 9350 with the UHD screen.